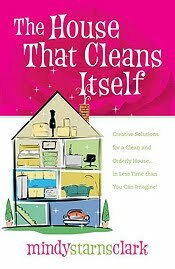 Recently I received a review copy of Mindy Starns Clark's book The House That Cleans Itself. (Yes, you do have to love that title!) I planned to review it in the ordinary way, but as I delved into the book, I found myself laughing, nodding in agreement, and just plain getting excited. This is a book that truly has the potential to change our lives. So here's what I'd like to do: I'd like you to go buy a copy of this book and read and work through it with me. You can purchase a copy at Amazon for as little as $6.47, or at ChristianBook.com for $9.99. There's even a Kindle edition. You may also read the first chapter at the author's website. I'll expose all the embarrassing details about just how messy my house is, take you with me as I progress through the steps in the book, and let you know just how well the method works for me. And I'd love it if you report back on how well (or not) the book works for you. Now some of you may be excellent housekeepers. You ladies need not apply. But if you think of yourself as a messy, or if you're constantly battling to keep your house clean or decluttered, The House that Cleans Itself is for you. You'll get some great laughs as the author confesses her most embarrassing messy house moments (wheat growing in the bathtub and clean maxi pads sticking on feet unnoticed are just the beginning). And, I hope, we can together conquor cleaning forever, as the author claims she has. I think what most won me over to this book is this: "Most housekeeping books tell you to change your behavior, but I say...your basic behavior in this area is probably not going to change much. My bottom line truth, therefore, is this: Rather than change your behavior to fit your house, change your house to fit your behavior!" For me, this is revolutionary. What do you think? Will you read and work with me? I'll start posting about my progress next week, so try to order your copies this weekend! If we weren't moving right now, I would totally do this with you. I'm going to order the book anyway in the hopes of implementing it in the new house. (God only knows when that will be!) I went through Sandra Felton's "Organizing Magic" a year or two ago. It emphasized changing small behaviors to create seamless maintenance. I found it very helpful and regularly apply many of the things I learned! But there are still problem areas in our house. I'd love to find a solution to those. GOOD LUCK! I never quite made it through Felton's book. At the time, it just asked too many changes of me. I love the theory behind "The House That Cleans Itself" and I'm feeling encouraged with my progress, although I'm sure it will be slow. I did this book, and mangaged to keep my house in showing clean condtion most of the time for 3-4 mos while showing it to sell, and that was with a 6, 4, 2, and twin 6 mos. olds around! I love this book and most of it makes brilliant sense to me, it really fit how I think and function, which is why I think it worked for me. Since then I have moved and the situation was a very clutter complicated one so I haven't been able to get this house into line! Slow and steady I am getting it there, love the book! I really enjoyed reading this book. I read it faster than most books I read before. Maybe because I was so eager to tackle my messy house, or maybe it was because of the inspirational proverbs at the beginning of each chapter. I began going through my h house, I have so far completed converting 5 rooms in my house to the HTCI system and I am so proud of it. The hardest one to tackle was the kitchen and I dreaded because there was so much to do. So, I decided to split it into two areas and separate days. I still need to return for the window cleaning. But it is very straighforward and so rewarding to see the clutter gone and a more manageable space to use and take care on the daily bases. I got my spouse to leave his suitcase in the coat closed in a spot I reserved specially for him just below where he can hang his coat next to mine. The kids use the opposite side of the closet and don't even need to open that side of the closet. I really liked the streamlined approach to make it easier to use and to keep it clean. Thanks a lot. I got the book from my library and will be returning it tomorrow. I also implemented a prayer (reading scriptures) time early in the morning and that has been the best. So glad to hear of your success with "House That Cleans Itself." It really does work!